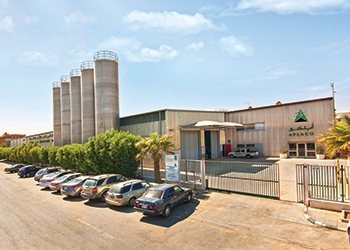 Aplaco’s facilities … the company is manufacturing almost to capacity. Aplaco is a member of the Sappco group of companies and was established in 1978 in a joint venture with Georg Fischer (GF) of Switzerland to manufacture quality pipe fittings tested to all relevant European, ASTM and Saso (Saudi Standards, Metrology and Quality Organization) standards. In 2004, Aplaco became a wholly owned Saudi company with GF continuing to act as the company’s primary technical support provider. Aplaco also became the sole agent for GF and an exclusive supplier for a range of specialist applications to complement the extensive and increasing range of Aplaco pipe fittings, inserts and valves manufactured in Saudi Arabia. Aplaco continues to take a market leading position based upon its manufacturing expertise, technical know-how, quality of production processes and product innovation. Aplaco is represented across Saudi Arabia in Riyadh, Jeddah and Dammam and many agents as well as across the GCC and Middle East and North Africa (Mena). Typically, Aplaco products are used in multiple applications in the public and private sectors for infrastructure projects, water distribution and sewage networks and for public housing and private villas. In addition, hospitals, schools, universities and the industrial cities across Saudi Arabia utilise Aplaco products and services. Pressure and non-pressure products are available for general water supply, drains and sewers, inside line drainage, soil waste systems, irrigation, swimming pools, water treatment plants, and industrial applications. CPVC fittings are available for most service pipe connections for both hot and cold water ranging from 140 to 210 deg F.
Aplaco sales and marketing manager Majdi El-Refai is also a chemical engineer by profession and operates from the production facilities in Riyadh’s first industrial city. “All our products are subjected to rigorous quality control testing both in our laboratories in our manufacturing plants as well as Saso and international independent testing laboratories,” says El-Refai. These rigorous standards including ASTM cover the PVC and CPVC compounds used in the manufacture of plastic pipes, valves and fittings on the basis of physical and chemical criteria. “There is the physical testing of the various compounds which contain additives and the special stabilisers in the extrusions processes and for the injection moulds. Then there are tests for maximum operating pressure requirements, dimensional accuracy, testing of fittings and material quality. Then there is the testing for toxicity and importantly for health performance too,” he adds. All Aplaco products are certified for use in different applications from local and international health agencies and institutes including Saso, NSF International, the Kitemark licence, TUV Nord, ISO 9001, Saudi Electricity Company (SEC), Saline Water Conversion Corporation (SWCC), and Saudi Aramco. El-Refai emphasises the importance of a complementary range of products to meet customer demand and also the innovative approach taken by Aplaco in new product development aligned to the demands of the construction sector. In the case in-Kingdom supply, Aplaco maintains inventory on other manufacturers including VDL from Holland, Alphacan from Germany and Eurostandard from Italy. “In terms of innovation, Aplaco is manufacturing 4-inch fittings for water applications, sewerage and waste water connections with extensive supply in the industrial cities of Ras Al Khair and Jubail for Saudi Aramco and Sabic for various projects. Aplaco has always invested in product development, quality control and service through our offices and manufacturing plants in Riyadh, Jeddah and Dammam as well as through our Sharjah operations,” he continues. Aplaco is headquartered in Riyadh and El-Refai stresses the importance of the central area for the company with demand also coming from the Ministry of Defence and Aviation (MoDA) and the expansion of the kingdom’s airports and increasing number of housing projects. According to El-Refai, Aplaco is the benchmark for these pipe fittings, a range that connotes quality and reliability. “The plants have great capacity and despite a challenging market, Aplaco is manufacturing almost to capacity with increasing demand,” concludes El-Refai.